All of David Maisel’s photographic series are typologies of the unknowable. This is immediately clear in his interpretive surveys of remote sites of heavy resource extraction, but it seems counterintuitive with the body of work known as Oblivion, whose subject is the geographically vast, populous, and media-multiplied region of Greater Los Angeles.1 In principle, an environment that is the total built product of human design and labor, as opposed to a denuded and destroyed natural landscape, should not evade human understanding. Yet the manner in which this work is visualized starkly renders the city as a photographic negative, casting it in enigmatic shadow, rejecting the precise and hyperreal saturation that distinguishes his other aerial work, such as in Terminal Mirage, which he was making contemporaneously. In producing this sequence as the optical inversion of conventional photographic representation, Maisel’s depiction of this superlative American city significantly detours from his earlier work, while presaging the methodologies that he would later apply to the nonaerial series Library of Dust and History’s Shadow. In short, Oblivion is elementally unlike his other aerial surveys, but it leaves viewers in a mysteriously familiar place. The intense hues of his color photographs often prompt viewers to ask Maisel if he has fabricated the palette he found in the landscape, and the answer is always a decisive no. The same cannot be said for Oblivion. At a glance this work comprises black-and-white fields of innumerable blocks, slabs, clefts, and ribbons—scantly recognizable except in composition as urban features. The city’s stark geometries appear crystallized, its tones reversed out of the normal spectrum into the chromatic negative. In these images the city is denatured, reduced to compositions of bituminous veins that thread among assemblies of ashen grids and prisms in transit to dimly glowing horizons. The palette may be a metallurgic neutral, but the intervention that yields the effect is not. By employing such an exaggerated technique, the artist reveals his contests with the dilemmas and conundrums of his subject. Oblivion may stand apart from the optics of Maisel’s work, but it is a tactical pivot in keeping with his aerial sequences. In Oblivion Maisel confronts our visions of the city today, and he summons culture, a subject seemingly absent from his industrially altered landscapes. In contending with the city subject, simultaneously prosaic and unimaginable, Maisel had to derange his own vision of it and devise a method of unknowing that itself could become a process and mode of envisioning. He also inserts a disconcerting query about the possible meaning, even relevance, of representation in a prolonged instant of post-9/11 trauma and global disarray. What remains are trenchant maps created in a moment of suspension and disjuncture. This moment is ineffable but epochal, breaking wither toward a transition into a new phase of being or perhaps a trajectory toward the end of all being. Of course, the map has been central to Maisel’s photographs from the beginning, unsurprisingly for an artist whose subjects encompass physical terrain. His cartography is not geared toward conventional expectations: orientation, course charting, preserving a record of a land. Nor are his scarred forests, sprawling mines, and malignant lakebeds surveyed with assiduous objectivity. None of the aerial suites gathered under the rubric of this book’s title, Black Maps, provide illumination; rather, they define the contemporary condition through a critical apophasis and plot the geography of a future that seems abruptly finite. This negative mapping is overtly articulated in Oblivion. Los Angeles is seen, but not the famed city of temperate climate, unyielding haze, and global image manufacture. From the circuitlike flatlands to the cilia of suburban tract that conform to geographic features, the development patterning was once singular. Urbanist Edward Soja describes “not a centralized city but a far-flung network of middle-sized towns . . . a new kind of urbanism . . . perhaps the first purely American cityspace.”2 The brittle, alien jaggedness of this city’s mien lends the effect of finding a lost civilization long submerged in an ocean of forgetting. The stand of downtown skyscrapers—if iconic, then only in their cinematic annihilations—are shadows reversed out to silicate flecks. The Santa Monica Pier juts like a mechanical armature across a spit of slate out into a slag plain. And more so than in Maisel’s other aerial series, here we have glances toward perspectival horizon lines, concessions to the nagging need to comprehend the scale of an urboid so vast that it crosses the threshold from mere global city into the mythological. The derangement of vision is a tactic that acknowledges that straightforward representation is deceptive. The city as site of human agency and community is not visible in this work, a meaningful denial of the humanist vision. This is perhaps the most appropriate method to articulate the absurdist forces that draw and consume Los Angeles, from within and without. Maisel flew several photographic sorties in late July 2004 to gather the source images for Oblivion. He was with a veteran helicopter pilot who ferried news and traffic crews above Los Angeles County’s vast urban plain. With this clearance, Maisel’s scope was in principle as geographically wide as he enjoyed in the expanses of Maine and in the Western states in the years before the terrorist attacks of 2001. His access to the city was not unduly restricted due to the post-9/11 urban aerial regulations, though LAX’s orientation created situations where Maisel’s helicopter would have to make sudden maneuvers to clear away from constant commercial air traffic, resulting in rapid ascents to maximal altitudes for most civilian helicopters, in excess of nine thousand feet. The multidimensional density of his urban subject gave him more glimpses of fellow airborne travelers, which were ultimately subject to the same tonal transformation exerted upon the city itself. Oblivion 6n (page 137) includes an almost incidental commercial jet cast in stark relief against a central spine of gray highway, like a black dart blindly transcending the urban mat or perhaps an insensate bug straining against the heedless grid, but in either case it is certainly a signifier of a specific moment in time. The distance of time has not erased the acrimony and disillusionment that suffused the first few years of the new millennium, and this moment still stands as the de facto American status; the color coded terrorist alerts may be gone, but we are forever at threat level yellow. International diplomacy was discarded in favor of a massive reassignment of domestic priorities toward security and multiple wars. If the possibility of culture outvoicing the powerful determinants of the military-industrial complex in American society was revealed to be definitively farcical, what value could culture possibly have in the new era? Maisel’s nullifying maps propose a crisis-fueled psychogeography for the inheritors of the urban imaginary. The specifics of imaging this work were not entirely preconceived. Maisel’s initial aerial projects were in black-and-white, but he made a dramatic shift to color for The Mining Project (1989), The Lake Project (2001–2002), and Terminal Mirage (2003–2005). Whether color or black-and-white, all of his landscape series were united in their resistance to visible geographic attribution. Maisel makes no secret of actual locations—place names are often embedded in the titles of individual images—but visual identification is difficult to impossible in these remote and abstracted locales. With the color work, he also consciously engaged with the amorphic abstraction associated with modernist nonrepresentational painting. Given these issues, the question arises: Why make LA the subject of this photographic series at all? 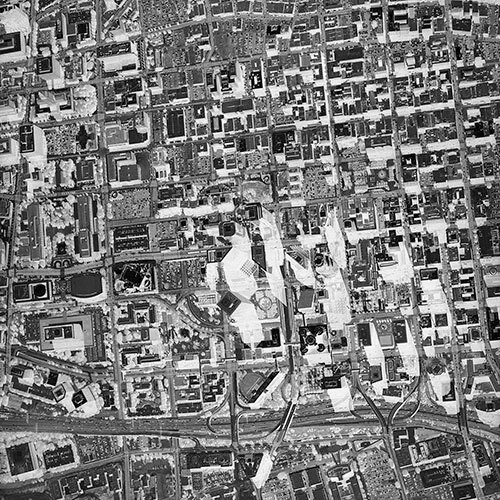 The particular factors that contribute to its resistance to visualization are well known: its centerless proliferation; its downtown core almost entirely devoid of iconic buildings, and which appears as just one node of a vastly networked conurbation; its abundant knots of freeways, the ultimate typology of nonplace among every possible urban feature.4 From above, the city suggests another kind of otherness, entirely distinct from the polychrome hallucinations of heavy resource extraction that define most of Maisel’s other aerial projects. Yet Maisel’s clear rationale for his choice of Los Angeles is also the city’s role in the etiology of Owens Valley, the subject of his groundbreaking The Lake Project. The scabbed bed that was Owens Lake results from a radical intervention—the diversion in 1924 of the lake’s source, the Owens River, to nurture a proliferating desert city. One of the greatest engineering feats of the twentieth century, this diversion enabled Los Angeles to grow boundlessly into the country’s second-largest metropolis, and it initiated a catabolic toxification of the exposed Owens Lake terrain. The dry lakebed is a resource bypass, a vast negative space that the resource consumption and sprawl of Greater Los Angeles fills, at a distance of two hundred miles. It is the story of an ecology of need, for Owens Lake could not have achieved its abject fulfillment, in a fundamental sense, without Los Angeles. Maisel was already primed for an alternative vision of the city differently through his preparatory mapping. Seeing Los Angeles in screen-scaled matrices reproduced via satellite imaging preceded the visual operations that Maisel would perform on the photographs themselves, and to some degree suggested the deranging torsion that they exhibit. His prefigured techniques of visual distancing from his recent aerial works—not just shooting in black-and-white film, but also with high-speed film in order to impart a grainy texture to the images—were intended to suggest a feeling of disintegration, or as Maisel says, “to feel like the city was made of ash.”7 As Maisel reviewed the negatives on the light table, he found that their tonal inversion was much more expressive than what he had printed—“threatening, spectacular, and haunting.”8 In that moment, Maisel saw the appropriateness of the negative image as a gesture that simultaneously embodied the visual exaggeration he had sought, as well as the metaphorical articulation of the psychological state he was trying to depict. And substance, in a sense contrary to photographic and epistemological convention, is what the negatives in Oblivion impart. It is important to remember—and it can be easy to forget, as physical film becomes increasingly scarce in photography—that the print proceeds from the negative. The negative is not a filter, appliqué, nor even the inversion of the positive image, but the image’s precursor. A series based on negatives does not comprise images just turned inside out so much as photographs, interrupted. Of course, the Oblivion images are not unmediated negatives. They are carefully rendered, like all of Maisel’s work. But the qualities that these negative-derived photographs exhibit are distanced from his prior color work, and they project palpable mass and structure. This chromatic display departs from the conventional art vocabulary while alluding to a range of visual technologies that penetrate surfaces. The X-ray immediately comes to mind, not least in the metaphorical sense, in the suggestive stripping back of a normative view to reveal the underlying structures. The internal view can render and reveal previous conditions; a diagnosis can result. The X-ray was pioneered more than a century ago, and its relatively soft images seem to harken from an earlier era like spectral signals. The optics of Maisel’s urban vistas suggest the more recent visualizing technologies of electron microscopy, their precision appropriate to an era of densifying information. And just as no living samples can survive the vacuum and electron bombardment of the sample chamber, so the city in Oblivion is inert, and our eye regards it clinically. Oblivion is a diagnostic scan performed on a culture in a state of conspicuous enervation. Here, the optical qualities and sublimated political logic evoke potent but unseen forces. In Oblivion 15n (page 155), a rare glimpse beyond any horizon in a Maisel photograph, black light flows out from the distance to suffuse the city in a colloidal murk. It is outside the capacity of an image to represent sound, but something like a muffled whir pervades these images, surfacing between the spaces of the heart beat, the eye blink. In that durationless fermata, the humanistic, causal world yields to a realm governed by a phenomenal presence, a mineral cunning. The city is in passage somewhere beyond human agency, toward the auto-assembling systems of the crystal, or perhaps the integrated circuit after it phase shifts beyond current bounds. Whether metasystem or psychological status, these numinous fossilizations mark the transition from human time to an epochal posthumanism. Just as Oblivion’s ghostly palette is nothing like Maisel’s other aerial suites, so does it diverge from the richly colored efflorescences of Library of Dust (2008). But in another way they preview that work in that they both speak about death. Taking on the city means contending with human culture, and these latticed gray fields of Greater Los Angeles offset and coincide with Maisel’s images of Robert Smithson’s Spiral Jetty, a much smaller and personally revered object of culture, made before and after Oblivion as part of the Terminal Mirage suite. Maisel constructed a unique visual via negativa to depict a superattenuated society at an uncertain pivot point. Its qualities are so imposing and idiosyncratic that the effort to decipher them is almost reflexive. A pessimistic reading would countenance the bitter moment when the work was produced and infers cultural exhaustion, a wish to abdicate human efforts, a confession that modernity’s wishful promise to society was just long folly. But amid the conclusion that lurking dread animates this posthuman urbanism, a final question emerges. “Oblivion” is so often used to connote annihilation that the word’s other essence can be lost: forgetting. If we dare to reinsert the humanist impulse into the mineral matrix, we might propose: What has been forgotten? Like the earth-shattering and absurdly simple epiphanies that alight in half-sleep, perhaps we can recover this answer during our long twilight. But those miraculous solutions almost never emerge intact from the dream state. The cities we create are increasingly sentient, in numerous senses of the word, and for those of us who perceive some kind of tomorrow that has departed the shores of human concern, we can at least recall one thing: that the purpose of the project of culture is to record its own condition, even unto its decline, with courage and imagination. 1 As Edward Soja concisely renders the inconceivable city: “Nearly 15 million people come together here in five counties: Los Angeles, Orange, San Bernardino, Riverside, Ventura. And embedded in it all is a galaxy of more than 170 separate municipalities, an agglomeration of agglomerations, each one with its own geohistory, its own spatial specificity of urbanism. It is difficult to know where to start.” Edward W. Soja, Postmetropolis: Critical Studies of Cities and Regions (Malden, MA, and Oxford, England: Blackwell, 2000), 121. 3 In its visualization, LA has widely evaded fixing in the mind’s eye. Lewis Mumford, in his massive opus The City in History (San Diego: Harcourt, 1961), rendered the prototypical interpretation of the city’s urban profile as “an undifferentiated mass of houses walled off into sectors by many-laned expressways” (page 510). A year earlier, urban theorist Kevin Lynch presented LA’s very low “imageability” in his influential study The Image of the City (Cambridge, MA: The MIT Press, 1960), 41. 4 However, in Oblivion 11n (page 151), a recognizable form of clover-massed silos emerges from the crystalline conglomerate of downtown: the Bonaventure Hotel, the architectural protagonist of Fredric Jameson’s essay “Postmodernism: or The Cultural Logic of Late Capitalism.” As the exponent of “postmodern hyperspace,” the Bonaventure contends with the great dilemma of late capitalist space: “the incapacity of our minds, at least at present, to map the great global multinational and decentred communicational network in which we find ourselves caught as individual subjects.” Fredric Jameson, “Postmodernism: or The Cultural Logic of Late Capitalism,” New Left Review 146 (July/August 1984): 83–84. 5 Earth Viewer 3D was the precursor to Google Earth, which launched a year later in 2005. Aerial charters had access to these proprietary services for a few years before broad consumer release; before SkyTracker, pilots relied on standard FAA charts and even on that standard analog driver’s atlas, the Thomas Guide. 6 Jean Baudrillard, Simulacra and Simulation, Sheila Faria Glaser, trans. (Ann Arbor: University of Michigan Press, 1994), 1. 7 David Maisel, email correspondence with author, June 13, 2012.